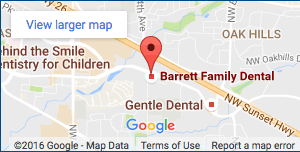 At Barrett Family Dental, your dentist in Portland, Dr. Richard Barrett wants every patient to understand the connections that exist between his or her oral health and overall health. In recent years, an overwhelming amount of research has found significant connections between an individual’s oral health and number of chronic disease, including diabetes, Alzheimer’s disease and stroke. In fact, a patient’s oral health and hygiene can even predict their risk of heart attack. Many oral health experts believe a direction connection exists between your oral health and coronary heart disease. The bacteria found in the mouth is believed able to cause blood clotting in the arteries that could increase your risk of heart attack or a variety of other serious cardiovascular diseases. Based on the findings of a recent Harvard study, your oral health influences the health of your heart and how it functions in several ways. For individuals suffering from periodontal disease or gum infections, even everyday acts like brushing or chewing can release harmful bacteria from the oral cavity into the bloodstream that can reach the arteries causing clots to develop. In fact, bacteria that cause gum disease are often located in the atherosclerotic plaque in the arteries of the heart and elsewhere. This indicates that gum bacteria can cause plaque and clots elsewhere in the body and disrupt blood circulation. This could be dangerous leading to internal bleeding, ruptured arteries, heart attack and other cardiovascular problems. To lower your risk of heart attack or cardiovascular disease due to poor oral health or gum bacteria, you need to brush and floss regularly. Keep in mind that flossing is more important than brushing when it comes to removing plaque and tartar from between teeth and below the gum line. When left in these areas of the mouth, plaque can lead to the development of cavities and gum disease, two primary risk factors for heart and cardiovascular disease. While brushing and flossing remain vitally important to the longterm health of your teeth and gums, you also need to schedule regular checkups and cleanings with your dentist in Portland, Dr. Richard Barrett. Cleanings allow our experienced staff of gentle dental hygienists the opportunity to remove plaque deposits from below the gum line, while checkups provide Dr. Barrett the opportunity to spot any oral heath problems early-on before they require potentially expensive or uncomfortable procedures to treat. With the evidence clearly pointing to the connection between an individual’s oral and overall health, patients can’t afford to take the risk with their oral health. Talk with Dr. Barrett during your next appointment at Barrett Family Dental to find out more about how your oral health can affect your heart health.